“We are excited about expanding our online offerings, because it allows us to reach even more students who are interested in a Christ-centered education but need the flexibility to take their classes at home and on their own time,” said Kevin Russell, Vice President for University Advancement at Belhaven. Belhaven’s online degree program differsÂ from other online degreeÂ programs, because it emphasizes personal attention to each individual student.Â The benefits of online learning at Belhaven go further than just the flexibility of classes.Â Â Belhaven’s highly qualifiedÂ faculty and staff offer the type of close, individualized attention to onlineÂ students not found atÂ mostÂ big universities. “While the programs are academically rigorous, the personal attention students receive during the admission process and once they enroll allows them to focus on their number-one priority… obtaining their degree,” said Russell. To learn more about Belhaven’s online degree programs, goÂ to the online degree section of the university’s website. Get free information from a list of online schools at Classesandcareers.com. Belhaven University (formerly Belhaven College)Â is aÂ private Christian liberal artsÂ institutionÂ that was established in 1883.Â Belhaven’sÂ 42-acreÂ main campus is located in Jackson, Mississippi.Â The university offersÂ Â 27 bachelor’s degrees and eight master’s degrees. Because Belhaven is a Christian university,Â its core curriculum is designed to help students navigate through the world of ideas while fostering a Christian worldview. Belhaven is accredited by both the Southern Association of Colleges and theÂ International Assembly for Collegiate Business Education to award associate’s, bachelor’s and master’s degrees.Â The university alsoÂ offersÂ Â pre-professional programs in Christian Ministry, Medicine, Law,Â Dentistry,Â Nursing and Medical Technology. 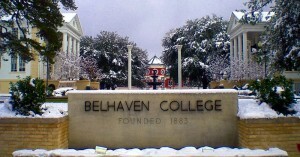 Belhaven University isÂ known for itsÂ nationally recognized arts degrees and business school,Â as well as its diverse out-of -state and international population. Belhaven now servesÂ more thanÂ 3,000 students from campuses in Jackson, Memphis, Orlando, Houston, Chattanooga, Atlanta and Online, offering traditional undergraduate degrees, graduateÂ and adult degree programs, and online degree programs. TheÂ university sponsors intercollegiate athletic teamsÂ thatÂ compete in the NAIA’s Mid-SouthÂ Conference inÂ football and the NAIA’s Southern State Athletic Conference in other sports. In addition, Belhaven University has repeatedly been named among America’s 100 Best College Buys and is listed as one of America’s Best Colleges by U.S. News and World Report. I think that it is great that they added five new online degrees, geat news!